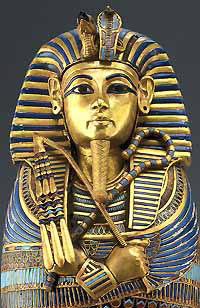 Okay, so I’ve been thinking about the King Tut exhibit. All the people I know who saw the exhibit in the 1970s raved over it. Raved. And these weren’t sheltered, never-been-to-a-museum yokels who wandered in by accident because they thought there would be roller coasters and/or funnel cake at the end of the line. It must’ve been better than the current exhibit--which, in its defense, is not billed as a replica of the first--now at Seattle’s Pacific Science Center, right? Granted, in the 70s, people also had a penchant for orange polyester pantsuits, men with perms, and macrame owls, so maybe there was just something in the quaaludes (whatever those were) that made them think that the original display of Steve Martin-song-inspiring-artifacts was somehow more awesome than it was. I should clarify. The current exhibit isn’t awful. There are a few pieces that make it entirely worth seeing. It’s just not worth $32.50 (the weekend rate; $27.50 on a weekday, a point that isn’t advertized on the Pacific Science Center’s signage). For $32, you can do a lot of things. Heck, for that exact amount, a guy named Derek Erdman will personally deliver a piping-hot bowl of Pho to anywhere in Seattle (Pho not included). Of the 130 objects in the current exhibit, only 50 are related to King Tut, and “less than half” of those are from the exhibit folks enjoyed back when . This marketing message is repeated more than once in the promotional materials. What they don’t say is that a lot of the really cool stuff from the original show didn’t make it into this version—and, understandably. Considering how much of Egypt’s patrimony (matrimony??) is on display, or deep in the basements of European and American museums, it makes sense that they would be a bit edgy about sending away their most iconic treasures. We’re probably not going to send the Liberty Bell, the Declaration of Independence, and all the remaining Tribbles from Star Trek: The Original Series off to Abu Dhabi for tourists to gawk at our “cultural heritage.” So I don’t blame the Egyptians for keeping the good stuff at home. 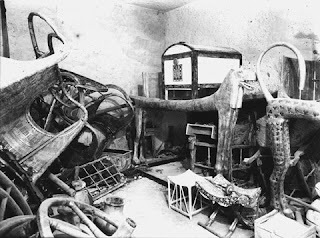 What we don’t realize is that, in addition to all the treasures you find in any given pharaoh's tomb, there’s also an awful lot of crap. 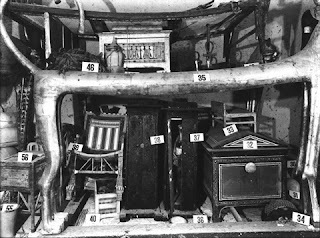 Basically, the tombs were as basically a mini-storage unit for the afterlife. In the black-and-white photographic murals shown at the exhibit, you see the tomb as Howard Carter found it in 1922. It was like discovering someone’s garage that they’ve “been meaning to clean out” for a few thousand years. Instagram photo before a Portland garage sale, or tomb of a "god on Earth"? The treasures in this exhibit have been described as “more muted” and “human.” In other words, less bling and more “everyday objects,” like a marble toilet seat (dead serious; wish I’d taken a picture) for the afterlife. For instance, on display at the current “King Tut” exhibit is a bed, possibly--or maybe not?—belonging to the Boy Pharaoh (doesn’t that name sound like he should be wearing a leotard with his underwear on the outside?). If I didn’t know better, I’d swear it was something someone picked up at a yard sale in Portland. There was also a rather fascinating travel-sized board for a game called Senat, complete with wee chess-like pieces. This was billed (seriously) as “the ancient version of an X-Box.” I had to wonder if this was pandering Seattle’s “tech crowd” (I guess ‘cause those IT types are WAY too stupid to get any reference that doesn’t directly refer to video games!). One of the most amazing items was a wee sarcophagus (pictured above) that once contained the boy pharaoh’s stomach. In the publicity stills, you think it’s a full-sized sarcophagus, but it’s about nine inches high, and, for my money, even more adorable than the real thing. His stomach got its own coffin! Little things that look like bigger things are so cute! Plus, just the right size to make a replica you could buy in the gift store! In April 2010, Zahi Hawass, the ubiquitous, then-Secretary General of the Supreme Council of Antiquities announced that the exhibit’s U.S. tour had earned $100 million for Egypt (not clear what part of Egypt). If it’s to help preservation efforts, I don’t so feel ripped off.